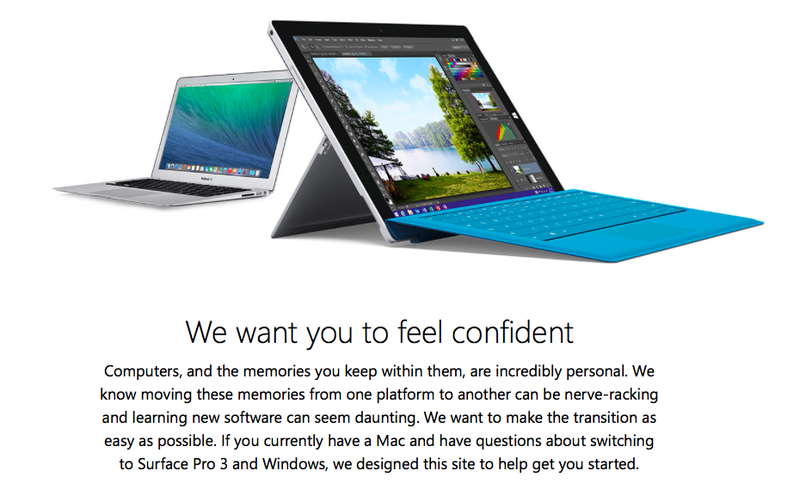 Microsoft has never been shy about trying to convert MacBook Air users into Surface Pro 3 users. Despite being in a room filled with MacBooks, Microsoft targeted Apple’s laptop head-on at its initial Surface Pro 3 announcement event. Now Microsoft is further highlighting the differences between the MacBook Air and Surface Pro 3 with a new online campaign (via ZDNet) intended to encourage Mac users to feel comfortable trying out Microsoft’s latest tablet. The recently launched microsite is the latest in a campaign largely led by ad spots (the latest holiday spot is almost pleasant) mocking the MacBook Air’s lack of touch screen, stylus, and more compared to Microsoft’s Surface Pro 3. Microsoft’s angle has been that users can replace both an iPad and MacBook with their laptop-spec’d tablet. The new site, however, first welcomes potential switchers then highlights features on Windows, frequently asked questions of potential switchers, how to move content from the different systems, and using Apple’s services with Microsoft’s Surface Pro 3. The promo page even links to a tutorial and FAQ for using your iPhone, iTunes, and iCloud with a Surface Pro 3. “Rest easy, your new Surface and iPhone will go great together,” Microsoft says. Sorry Windows Phone. Does Microsoft’s latest campaign tempt you to try the desktop-like tablet or just serve as more entertainment for consuming on your iPad or MacBook?